Music and sport don't often mix - and when they do, it's usually a disaster (think Jacko, Gazza, Shaquille O'Neal). But every so often, a sports anthem becomes the exception to the rule. 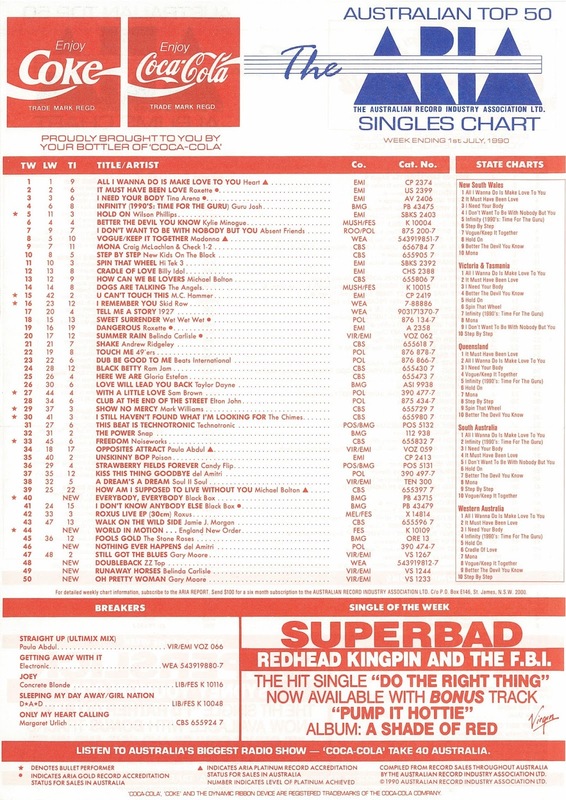 Twenty-five years ago this week, arguably the greatest sports-related single of all time debuted on the ARIA top 50. The single wasn't even in support of an Australian team, but since it managed the difficult combined task of being a good song and appealing to soccer fans, that minor detail didn't matter one bit. Meanwhile, I've gotten in trouble from a couple of readers for slamming "All I Wanna Do Is Make Love To You", so all I'll say is that the Heart single retained the number 1 spot this week in 1990 for its fourth and (thankfully) final week. Oops, sorry. A few weeks back on my 1985 posts we saw the arrival of their best-known song. By 1990, Katrina and pals had resorted to appearing on China Beach to perform this cover of The Animals hit from 1965 - with that band's lead singer. The Bangles had set each other free, having broken up at the end of 1989 - and so the (literally) obligatory Greatest Hits album followed, promoted by this remixed version of a track from final (for the time being) studio album Everything. "Sleeping My Day Away / Girl Nation" by D.A.D. It broke in to the top 100 back in the first week of March at number 64 - and all these months later, "Sleeping My Day Away" was still yoyo-ing up and down the chart for the Danish rock group. But, even the added bonus of previous chart single "Girl Nation" could only push "Sleeping My Day Away" to a peak of one place higher than its original debut. Of the two songs, I much preferred "Sleeping...", with its stronger chorus and almost New Order-esque bassline. Like D*A*D, Gary Moore was another artist charting two singles from the one album simultaneously - and as we saw last week, "Still Got The Blues (For You)" would end up as his biggest Australian hit. Meanwhile, this earlier single from the Still Got The Blues album - which had nothing to do with the similarly named Roy Orbison song - popped its head into the top 50 for a single week. Besides Gary's own playing, "Oh Pretty Woman" features the guitar work of Albert King, a contemporary of (but no relation to) BB King. Well, the good times had to come to an end at some point. After enjoying a career-best run of singles - three in a row inside the top 25 - Belinda Carlisle's fourth cut from Runaway Horses never really got out of the gate despite being another really great track. In fact, it would drop out of the top 50 the following week before rallying just enough to reach its peak of number 44 the week after. Their career dated back to 1969, but it wasn't until 1984 that ZZ Top scored their first Australian and US top 10 hit with "Legs", the fifth and final single from the mammoth Eliminator album, which saw the rock trio fully embrace New Wave music and MTV. Six years on, and the band known for its bearded members (and the fact that the guy without a beard had the surname Beard) hadn't changed the formula much. Fittingly enough, their 1990 album was called Recycler, while this lead single's title was also rather appropriate - both because of the fact that their sound harked back to their mid '80s peak and because it was taken from the soundtrack to the third and final film in the Back To The Future trilogy. But, "The Power Of Love" it wasn't. Debut single "Kiss This Thing Goodbye" was slowly winding its way out of the top 50 and was this week joined by this follow-up, which had been slowly working its way into the top 50 over the past month and a bit. While "Kiss This..." had launched the Scottish band in Australia and the US, "Nothing Ever Happens" was the song that'd given them their breakthrough hit at home in the UK, where it peaked at number 11. The song wasn't so big here, slipping back out of the top 50 in a couple of weeks' time. In Australia, there's been the odd sports-related song to visit the ARIA chart over the years - most notably VFL anthem "Up There Cazaly" and cricket supporters' song "C'mon Aussie C'mon", which both reached number 1 in 1979. But, our track record of sports singles pales in comparison to the UK's, where soccer songs in particular invade the chart on a pretty regular basis. For the most part, the tunes themselves are dire - snapped up by fans in the same way as they'd buy a jersey or scarf. 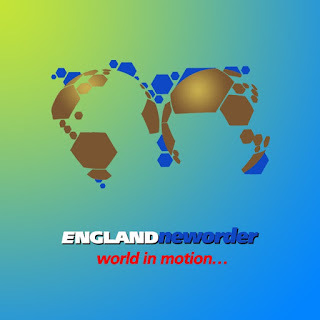 And then along came the official single for England's 1990 World Cup team. Recorded by New Order, with a little help from player John Barnes, who provides the song's rap, "World In Motion" shocked everyone by being a genuinely good song that could be enjoyed away from its connection to soccer. Proving the point, the single almost reached the Australian top 20, which can't only have been down to expat soccer fans. Indeed, it's one of my favourite singles from 1990 - and I like sport about as much as I do novelty records. It'd all been going so well, but after two straight top 10 singles, Italo house combo Black Box suddenly found themselves scraping the bottom end of the top 40 with their third single. Despite being the week's highest new entry, "Everybody Everybody" didn't progress much further - although it was a very different story for the dance act in the States. There, the track, which was once again performed by Martha Wash and mimed to by Katrin Quinol, went all the way to number 8. Released in the US with a different main mix and an alternate video, "Everybody Everybody" became the first of three chart hits for the group on the Billboard Hot 100 - their second was a re-release of "I Don't Know Anybody Else". It wasn't the end of the Black Box story in Australia, however, with a cover version soon to return them to the upper reaches of the ARIA chart. Next week: one of my most hated songs of 1990 debuts - so there's something to look forward to! Plus, another new Aussie rock band fails to turn major label interest into chart success. Pretty sure I've never heard the Katrina & The Waves/Eric Burdon duet before, and am surprised it dented the top 100. I was a Bangles fan (but not fan enough to buy 'Everything' until its reissue a couple of years ago), but never heard 'I'll Set You Free' at the time. So it actually did quite well to chart here, given there was no video and no promotion for it at all, and that it was from an over a year old hit album. I thought 'Sleeping My Day Away' sounded a bit Metallica-ish with the bass. I'd forgotten how 'Oh Pretty Woman' goes until hearing it here again. 'Runaway Horses' was my favourite single from this album of Belinda's. It deserved to do much better. I love a good depressing song with intelligent lyrics like 'Nothing Ever Happens'. I'm sure it sounds even better in a Scottish town with gloomy weather. I like 'World In Motion', though it seems odd that they'd even think of releasing it here, let alone it becoming a hit. I love the music just before and during the rap bit, though the 'rap' itself is pretty dodgy, I thought. It seems like a strange move now for New Order to have done this at this point in their career. Gillian looks so uncomfortable in the video, even though she wrote the song from memory. You have to wonder what Martha Wash was thinking when asked to sing Engrish lines like those appearing in 'Everybody Everybody'. I remember an article or review on 'Everybody Everybody' in Number One where they commented on how many different mixes there were of the track, "and doubtless even a rice pudding mix." I much prefer the single mix we and the UK got over the US one. I liked the video too, with Katrin colour-coordinated with the field she's running through.